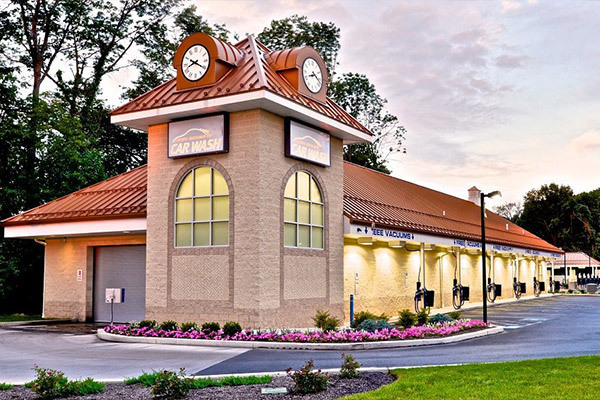 With over 50 years of combined Car Wash Experience, we set the industry standard for professional, environmentally friendly car washing services. 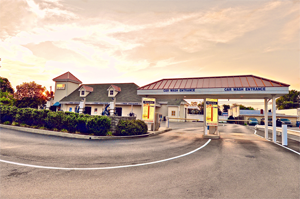 Using cutting-edge technology, we minimize the environmental impact that a full service car wash has on mother nature. Our process is so revolutionary it is actually more dangerous for our customers to wash their cars in their own driveways than at one of our four locations. So whether you drive a sports car, truck, SUV, or motorcycle, you know that you can trust Pete’s Express Car wash to get your vehicle back on the road looking cleaner than ever! We are your friendly neighborhood car wash.
Getting your car washed does not have to break the bank. 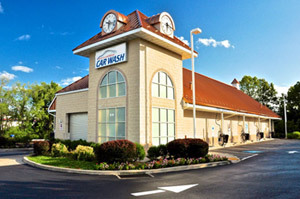 Try our quick and easy $4 exterior car wash. Between easy to use touch screen monitors and our fully automated tunnels, your car will be cleaned, polished, and dried without ever leaving your car! We offer a central vacuum system which provides you with the most reliable and strongest suction commercially available. It’s also free every time you get your car washed! Our soaps and polishes offer your car paint protection and ultimately increase the longevity of your vehicle’s finish! Did I mention they are all 100% biodegradable chemicals? Through our state-of-the-art water filtration and delivery system, we use the smallest amount of new water per wash! Ultimately, we use less water per car than if you washed your car in your driveway! 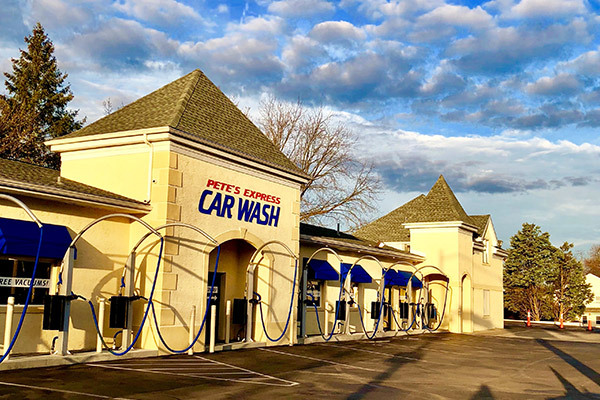 Using Pete’s express car wash over your personal driveway also reduces detergents, oils, and other pollutants from entering your community’s storm sewers, local lakes, streams, and rivers! 1. Are the vacuums really free? Absolutely. 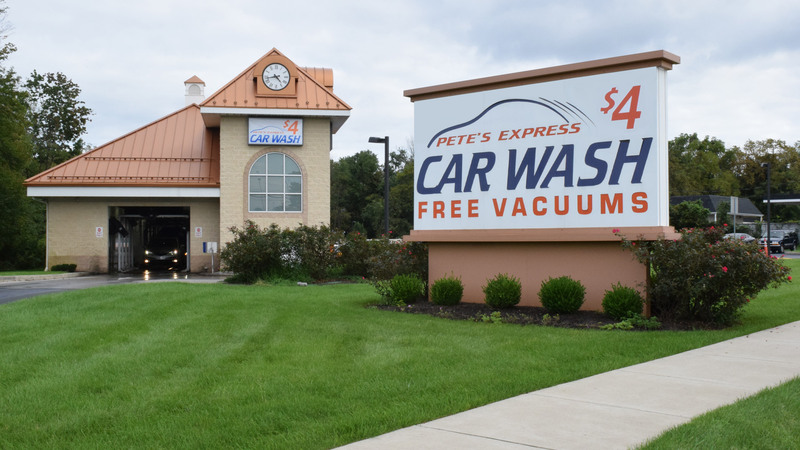 Customers of Pete’s Express Car Wash can use the free vacuums after they have paid for a car wash.
2. Don't car washes waste water? Unlike washing a car in the drive way, we use a minimum amount of new water per wash. Washing a car at home uses much more water than we do! Before our wastewater is discharged to the sanitary sewer system, we remove oil and dirt. And unlike washing a car in the driveway, we never release wastewater to storm drains, surface waters, or to the ground. This is our community too and we want to keep it clean! We share with our customers the desire to conserve water and protect the environment. We also conserve water through the use of specially designed spray nozzles. The nozzles are timed by a computer to go on and off at the appropriate time and they also spray at an angle that uses less water – technology not available at our local competitors. 3. Why not wash my car in my driveway? When someone washes their car in the driveway, the detergents, oils and hard dirt pollutants are deposited into the storm sewers which run into our local lakes, streams, and rivers. 4. What's the benefit of washing my car regularly? Our soaps and polishes help protect and maintain your vehicles finish and help maintain the value of your vehicle. Plus, a clean car feels great! 5. What else can I do to maintain the finish of my car between washes? Wash off bugs, tree sap, bird droppings as soon as possible. These contain acid that will eat at the clear coat and painted surface of your car's finish. We offer FREE vacuums at each location! The Pete’s Express Car Wash gift cards are reloadable and can hold as much money as you would like to transfer to it. Please call or come by one of our locations to order a gift card. 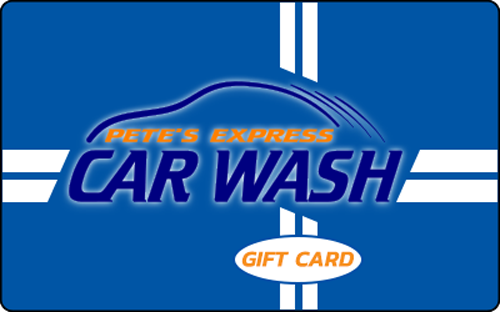 And don’t fret – your Pete’s Express Car Wash gift card is available at all four locations! Visit us at one of our 4 Convienient Locations! Have anything to tell us? We're listening!